Ashraf al-Qedra, spokesman of the Health Ministry in the Hamas-ruled coastal enclave, told reporters that Maysara Abu Shaloof, 15 years old from Jabalia refugee camp in northern Gaza Strip, immediately died of an Israeli gunshot in his abdomen. Al-Qedra added that 66 demonstrators were injured, including 15 children and two paramedics. 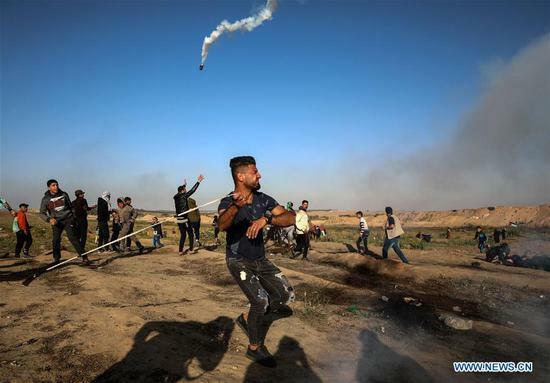 Friday's clashes were part of the weekly anti-Israel protests that have been going on in eastern Gaza Strip, close to the border with Israel, since the start of the rallies and protests, better known as the Great March of Return on March 30, last year. Al-Qedra said that 272 Palestinian demonstrators were killed and more than 30,000 injured. The High Commission of the Great March of Return and Breaking the Israeli Siege had earlier on Friday called on the populations to join the weekly protests in eastern Gaza. The demonstrators gathered in the area close to the border with Israel and clashed with the Israeli soldiers stationed on the borderline area. The soldiers fired tear gas and live gunfire at the demonstrators. Israel Radio reported that several demonstrators threw homemade hand-grenades at the soldiers, adding that the soldiers dispersed dozens who tried to cut the fence of the border and infiltrate into Israel. The Great March of Return is calling on Israel to end 12 years of blockade that had been imposed on the Gaza Strip right after Hamas movement had violently seized control of the territory in 2007. Khalil al-Hayya, a senior Hamas leader, who joined on Friday rallies in eastern Gaza City, told the crowds of participants in the rallies that the march of return will go on until the marches meet the demands of the demonstrators in ending the siege. Over the past few months, Egypt, the United Nations and Qatar have been mediating a calm understanding between Hamas and Israel to defuse tension on the border with the Gaza Strip. "The occupation (Israel) has no choice but to abide by the understandings, which were mediated by Egypt on achieving calm in the Gaza Strip," said al-Hayya, adding that "understandings still exist and we observe the occupation's behavior." Israel began last week to ease some of the security measures that had been imposed on the Gaza Strip, where it reopened the close crossing points and expanded the fishing zone off the Gaza Strip's cost to 15 nautical miles instead of six. The commission of the march of return called later in a statement on the populations to join the upcoming Friday rally, April 17 which is the annual Palestinian Prisoner's Day anniversary.